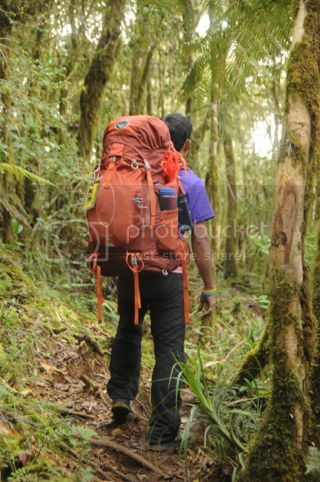 days before we departed for kibungan, i was already dreading the travails of the third day. the vivid descriptions of steep walls and trails disappearing into chasms had filled my heart with anxious worry. i knew, even then, that despite having allowed myself to heal, i wasn't my usual self. i was tentative with my step, too careful in fact that i would readily accept an accusation of being scared. 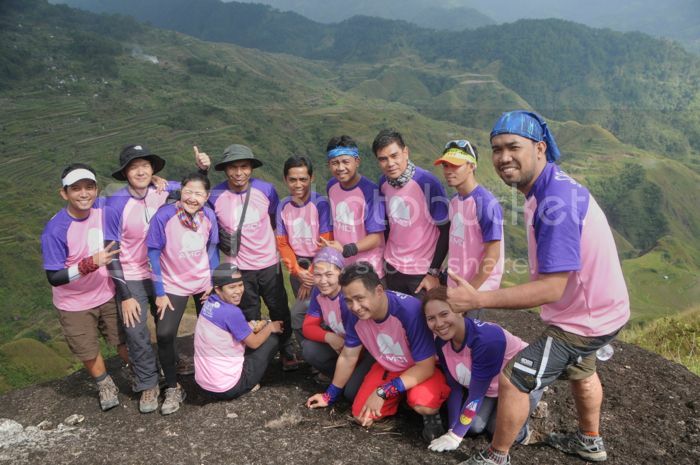 but more than my lack of complete confidence was my fear for people less experienced than i. my participation in this climb was chiefly to support the new batch and witness their storied induction into the club. i worried that i would magnify their fears if i myself were filled with anxiety. it did not help that at the first light of day following that evening of torrential rains, we witnessed exactly what they meant when they said the trail would be steep. in fact they were wrong. there was no trail, nothing palpable at least. the campsite was hurriedly built too close to a precipice. 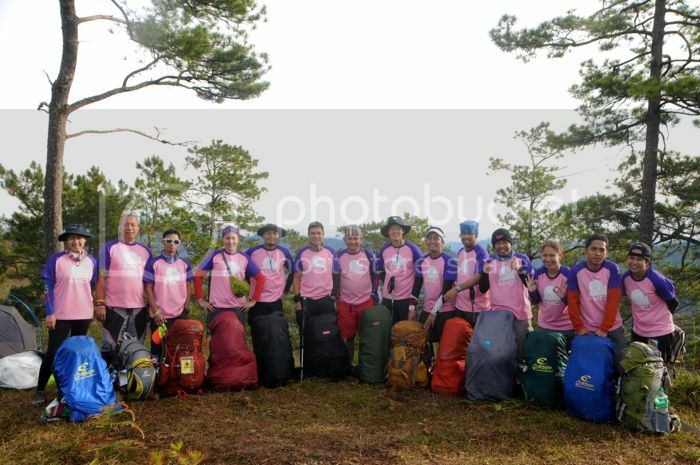 the mountain we slept on was a hunk of rock with a sheer vertical face that marked the boundary between benguet and ilocos sur. depending on which town you were on, the wall either rose or fell 400 meters. a measurement which by any standard did not inspire confidence. standing on its edge, it was not even possible to look down and see where the wall ended. but what a sight it was: beautiful, frightening, and inspiring. i was assuming before we departed that they would put the matter to a vote. although i was filled with fear, i wanted to take on the challenge of the 400-meter wall. but because i knew not everyone was like-minded, my vote was to take the longer but safer route. when arnel gathered us for the morning briefing, he gently -- as was his manner -- broke the news. i was relieved the burden to choose as the TL himself had decided. given the circumstances exacerbated by the weather, we would skip the wall. the announcement took a while to sink in as there was a moment before the applause interrupted arnel. the cheer was an expression of relief more than anything else. we began the day filled with energy despite the gloom that filled the sky. we enjoyed the view as much as we could. our quarry, a little barangay on the fringes of the town of sugpon that was perched on a hill surrounded by terraces, the grand amburayan river, and the wall of rock that separated us. as clouds occluded our view, we merrily went our way, witnessing all things beautiful. the distant cliffs were suddenly lined with casual waterfalls. along our trail were trees and bushes that bore fruit: guavas and cherries and other things i wasn't sure were edible. despite having been to many far-away places, i am always still filled with awe and surprise each time i come upon communities that have neither roads nor infrastructure, but where families make their homes, or where the residents cannot even speak a word of tagalog, but express kindness and generosity in so many languages. below us, the guide pointed to a lovely village where terraces radiated outwards, and at the center of which was a barren square that marked the school grounds. in many of the places we passed, the houses are sprinkled across vast swaths of wilderness and plantations. and yet there would be schools and parishes and a semblance of government. these villages function when we expect to find nothing resembling civilization. 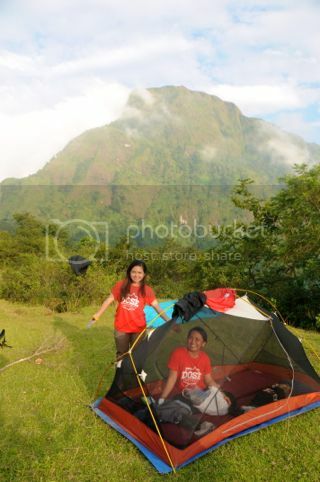 in fact, we have been on the edges of civilization since 3 days previous, when we were deposited at the foot of mt. tagpew in mayos, on a seldom-used rough road that connects kibungan to bakun. ahead of us rose monoliths whose peaks disappeared in the distance. 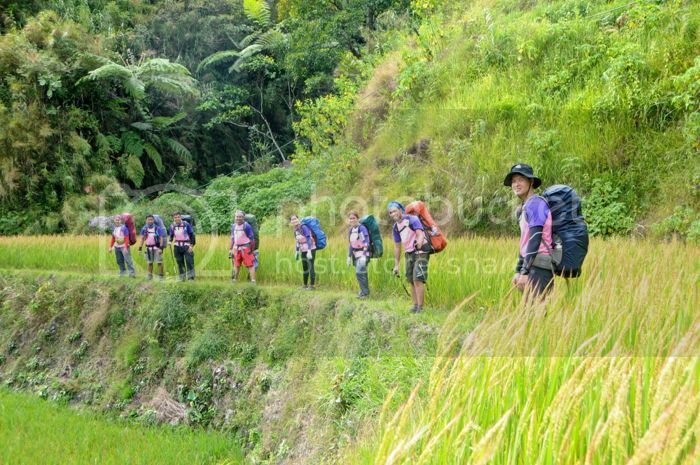 our trail would take us across arcs with vines of the sayote, and onto paddies that extend and climb into the palina rice terraces. the presence of carabaos belies the fact that there are parts that are extremely difficult. to get to the viewpoint, which is a platform of rock overhanging a cliff, a steep trail has to be overcome. and yet the cavalry does not end there, not even an hour later when you reach legleg chapel, where a road suddenly appears. i have been this way before, and it does not help that i know the trail. it does not make the trek shorter, nor the climb, less difficult. when people ask if we were nearly there, my response was realistic: not really. a short road branches out from the chapel, which quickly funnels again into a foot trail, where the face of tagpew appears, its cheeks equal parts rock and pine trees. at its shoulder, a garden of flowering plants had randomly grown. it was not there last year. at this point i predicted it would be nightfall by the time we reach the campsite, which sits on the summit. my group was scattered along the trail: 3 would be among the first there, the rest possibly arriving with the last of the sweepers. we forged on, resting every few steps, and munching trail food under the giant Y of a pine tree shaped like a slingshot. it got cold immediately after sunset, and the sounds of tents being pitched gave us hope. at half after 6 my trek buddies and i arrived, and we waited while others triumphed over their labors on the trail in order to prepare dinner. it was a long evening, as i remember, and one group managed to carry an entire lechon, along with the stick of bamboo that skewered it, up the mountain. that feat takes much away from my description of the trail, but it was achieved by sheer audacity. the following morning, while we were breaking camp, a platoon of camouflaged policemen suddenly appeared. they carried heavy firearms and wore uniform haircuts. they said they had been on patrol since the previous night, and noticed our lights in the distance. not taking their chances, they camped far away from us, possibly observing what our business was on the mountain. later on in the trek, i struck conversation with one of them as he fiddled with a magellan GPS and asked to see the topographic map he was holding. there were small green circles on the map, and below, its legend: suspected marijuana plantations. 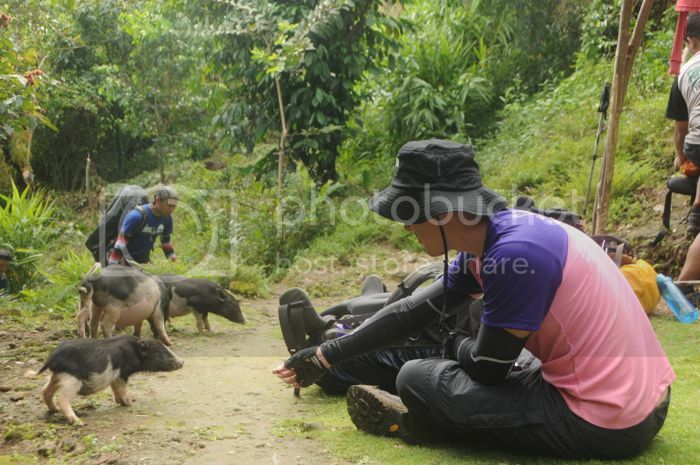 that the benguet police would share the trail with us for a few kilometers in their search for these weed farms could indicate many things, among them being that around us were happy fields, and that we were possible couriers. from mt. tagpew, the trail drops down to the geday trail, rises to the bulalakaw ridge, which is now missing one mighty pine tree, and then onto mount oten, where the trail breaks off, one leading towards tacadang and the other to our day 2 campsite: mt. litalit, on the batangan edge. i have been to kibungan 8 times previously, a number that is second only to one other person, and yet none of my previous experiences was useful to predict what lay ahead. i have only seen this place from far away, wondering what was there, wanting to see it for the first time, but this was already on the fringes of the province, and not part of the usual kibungan circuit that brought us from the municipal hall and back. 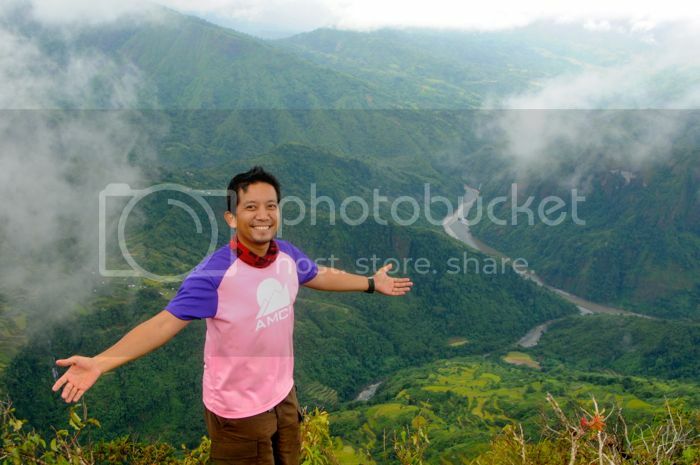 in the distance is where cordillera’s range dwindled into the plains of la union and ilocos sur. 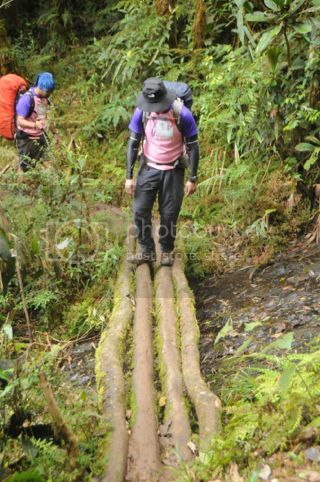 the genius of this induction climb trail was that it would traverse all these three provinces. for someone who has been on more than 200 climbs, a new mountain experience is always very exciting. 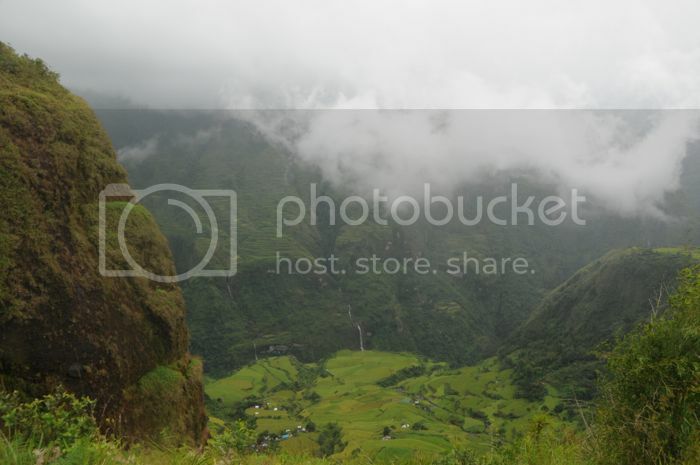 at sitio dalipey, where there are prostrate metal posts waiting to be erected, i bade goodbye to the policemen, and wondered how much more we had to walk that day, even as the weather soured. when we descended the pewpew-an stairs, it was already raining. i have a size 11.5 boot, and only less than half of that would fit on any of its steps. it was a short but perilous staircase, which eventually opened into a stream and onto a landscape so alien and yet so familiar to me: the valley below was a stadium of rice paddies, that ended abruptly when the mountain transformed into walls. the trail followed the unsteady riprap of these terraces, and transformed into all sorts of surfaces. in some places, small footholds had been pounded into sheer rock. we passed a community where a man who sat under the eaves of a school building said that the campsite was near. of course, what he meant was that it wasn’t going to take us a day to reach mt. litalit, but near didn’t mean 5 minutes away. the landscape changed rapidly here, and a forest appeared, then disappeared as we approached a brown hill. trail signs had all but disappeared and we found it only by following voices. it was gloomy, and nearly dark, and our group found an area on the sloping end of the campsite. when the rain started to pour and the wind started to howl that evening, all the water drained and passed through us. it was a struggle to prepare dinner, and to keep ourselves dry while we ate. at one point someone used my spork as a peg to keep the kitchen parawing from flapping. immediately after i had eaten, i retreated to my tent, and waited for sleep to capture me, even as i feared the tent nearby might have been blown away. the unmistakable rattle and pop of nylon kept me awake for a while until it became so routine and predictable, that i eventually dozed off, only to be awakened by the arrival of the sweepers. the next thing i knew, it was already the following morning, and i was trying to make sense of the carnage of the previous night’s brief but powerful storm, which laid waste on our kitchen. 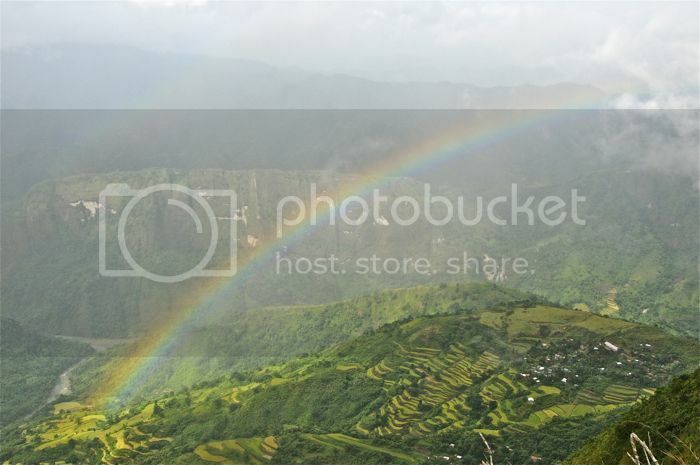 later during the trek, a colorful apology and a promise appeared, which healed the worries that resulted from that dreadful weather. i felt a little miserable looking at our kitchen until i found out that others were faring far worse than we. in fact, it was our group that first finished packing, and first to find that less than 10 meters away, the campsite ended, and the earth fell 400 meters down. in the distance. the amburayan bent like a horeshoe, enclosing our destination on the final day. 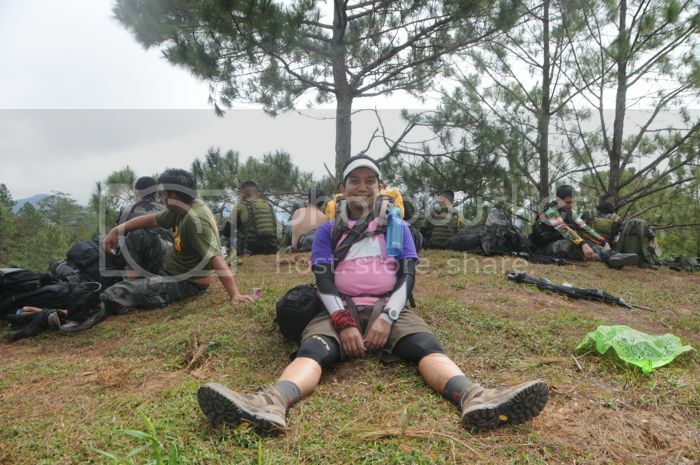 i knew little about geometry, and since this trail was not part of the reconnaissance climb, it was not possible to predict how long it would take for us to reach licungan, considering that we took a less direct route. so all the beautiful things we encountered along the way were pleasant surprises: cold pools and waterfalls poured from unseen streams. i encouraged my inductees to stay and enjoy nature’s many pockets of wonders, even as others seemed to be in an imaginary race to reach the campsite first. i could very well trek as fast as anyone in the team, but i choose to take my time when presented with an opportunity to be a child, to find what i did not initially seek, to ease some of the burdens inherent in mountaineering. besides, we had lots of time ahead of us. eventually, we found a trail that passed through a community, where people were always smiling, dogs were barking, and our campsite, nowhere in sight. there were stairs that just kept going up, stores that sold bottles of fundador but neither sprite nor coke, and children who stared but were too modest and shy to stay when approached. the campsite was less than 10 minutes away from the school, a distance sufficient to drown the noise we might generate. behind us rose the behemoth that is litalit, with its sheer wall rising abruptly. i looked at it for a very long time and could not imagine that there was a trail there somewhere, apart from the one we took. 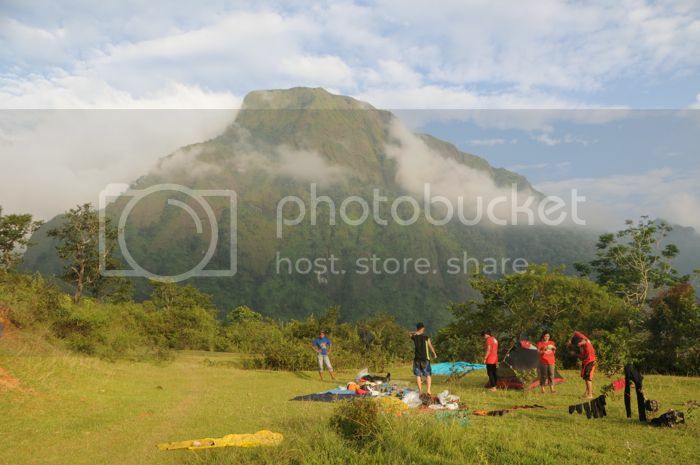 i could make out the edge of batangan, and where our previous campsite was located, and nowhere between was it possible for human beings to pass unless they rappelled down the mountain. clouds swirled over mt. litalit even as members and inductees trickled into sugpon, and the campsite slowly took shape, with our colorful tents scattered on this area as large and as flat as a football field. that evening, while we solemnly inducted 40 new members into the club, the stars were in complete attendance, even as a faint light appeared on the black north wall below the batangan edge. it was our last night on the mountain, and although i went into my tent early, i was called out and eventually slept under another group’s kitchen. 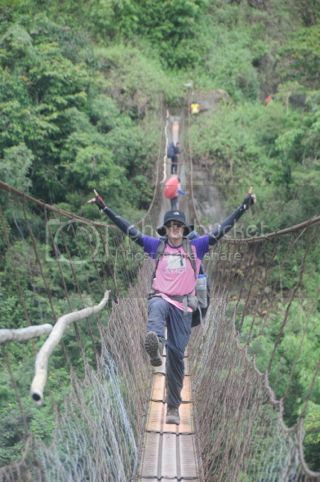 i would be among the last few people to leave sugpon, and tackle the descent to amburayan, the perilous cross on the longest hanging bridge in my mountaineering history, and the final push up to sap-ayan, in la union. along the knee-breaking descent were parts that seemed to make no sense at all. 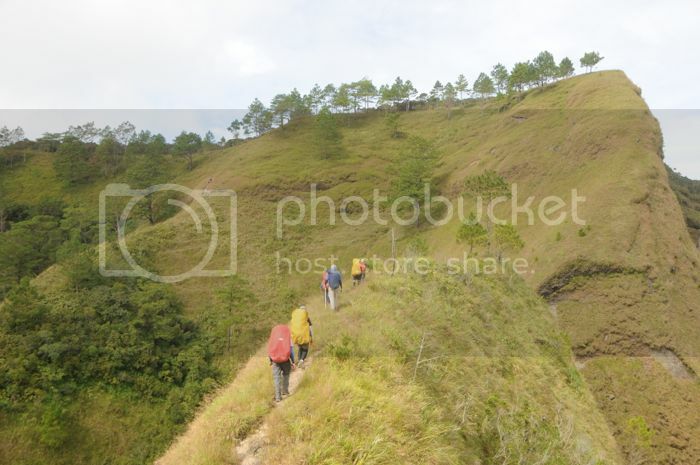 i imagined the descent along batangan’s north wall might have looked like this, but magnified many times over. along the way we encountered a group of men who took turns to carry a large pig, on its way to be slaughtered in batangan for a wedding feast. then we came upon the amburayan river, and the hanging bridge which connected ilocos sur to la union. it was indeed very long, and perched high above the exposed bed below. while i have no fear of heights, many others do, and i can imagine that it must have been quite an ordeal for them to cross its nauseating length. after getting across, i munched on lunch, and was very quickly reminded of the unique trait of all my climbs in kibungan: it always ends with an ascent, no matter that we were beyond its borders. 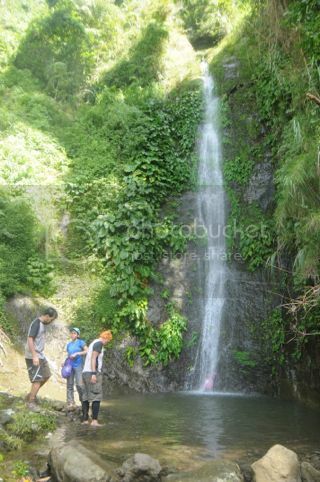 the climb from amburayan river up to sap-ayan in santol was terribly exhausting. we had already poured our energies to the challenging trails of the 3 previous days, and did not expect that we would be spending our last few hours on the trail climbing another mountain. by this time, my steady crew of 3 increased by 1, and we distracted ourselves by sharing stories and the last remaining morsels of our trail food as we gained altitude. there was no telling how much higher we had to go. the trail signs didn’t say how many kilometers were left in our trek, and i could only estimate based on the gain in our altitude. by this time, despite finding many refreshing water sources along the trail, my throat was parched, and i was eager to take my boots off. i was also hoping to find a toilet. 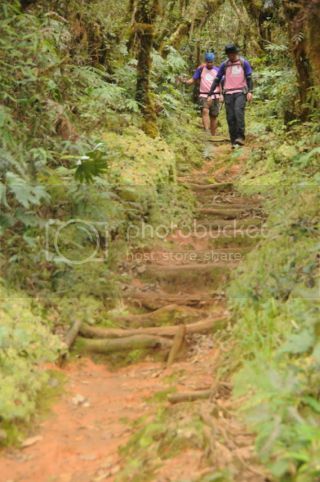 there came a point in the trek that we just kept walking, like zombies lured by the scent of life. i only knew that the end would be a shed where presumably, a jeepney would already be waiting. suddenly, the end of our quarry appears, just as the roads widen and electric posts increase in number. finally, the trek’s end. i gave my fellow members a hug, and beamed with a smile of relief and accomplishment. 3 provinces. 3 towns. 3 nights. a storm. a rainbow. countless rice terraces and streams. a few waterfalls. i freed my feet from the confines of my trekking shoes, and sat on the jeepney’s roof, admiring the view, reflecting on the merry adventure that took place the last 4 days. of course we were not nearly done. there was still the matter of the long and perilous ride to san juan. 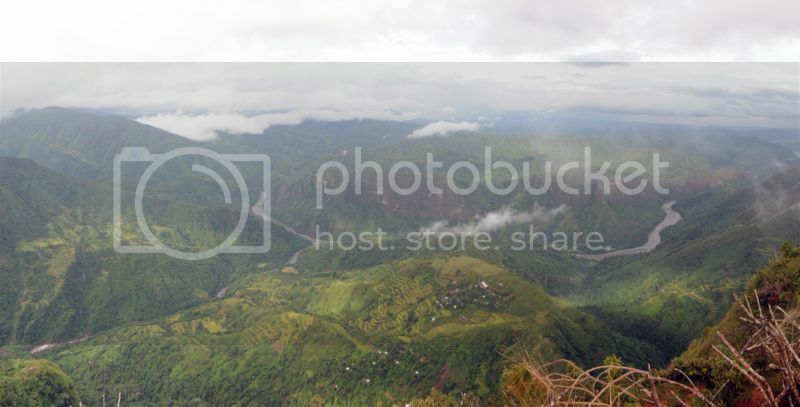 apparently, the road network leading to santol was lazily done, following the wild contours of the mountain, teetering too close to the edge of cliffs, with sharp hairpin turns that must assume jeepneys and other vehicles bend their metal bodies. but these jeepneys have expert drivers who steered us safely to this surf spot where beds, a warm shower, a videoke machine, and a dinner buffet awaited. i distributed t-shirts to my bigaon groupmates: a worthwhile treat for enduring me and suffering my insults for the length of this induction climb. i scrubbed off the grime that collected from the 4 previous days, and i marveled at seeing my own face again after so long a time. it dawned on me that civilization has a number of requirements i must comply with: a clean face and freshly laundered clothes, and i willingly conformed. as i walked along the beach of san juan, i looked around me and was a little surprised at how the allure of surfing has transformed this part of la union. and then i wondered: why does civilization inspire habits that turn us into barbarians: uncaring, unfeeling, and violent towards that which makes us human and alive. i have just spent 4 days in places far and wild, free from the shackles of a modern world filled with needless expectations and requirements, where i am not judged based on how i look, but on what i can contribute to sustaining us each day. elsewhere, in villages on the fringes of backwater towns, where access is restricted but to the most intrepid, and where things may be regarded as primitive, i learn how it is to be more civilized. i engage in these difficult pursuits because i wish to be liberated from my modern worries: to carry on my back all that i need, and to hold on to that which is precious and necessary. i welcome the new members of the club with hope and optimism. may you all find humanity in the most savage of places, value only that which is essential, and spread the good word about the world outside.